The GRAS AL0008 is an adapter for mounting a microphone set (microphone/preamplifier) on tripods having a standard 1/4” UNC-20 male thread. The adapter clamps on 1/2" diameter preamplifier. For minimum acoustic influence, clamp as close to the output as possible. 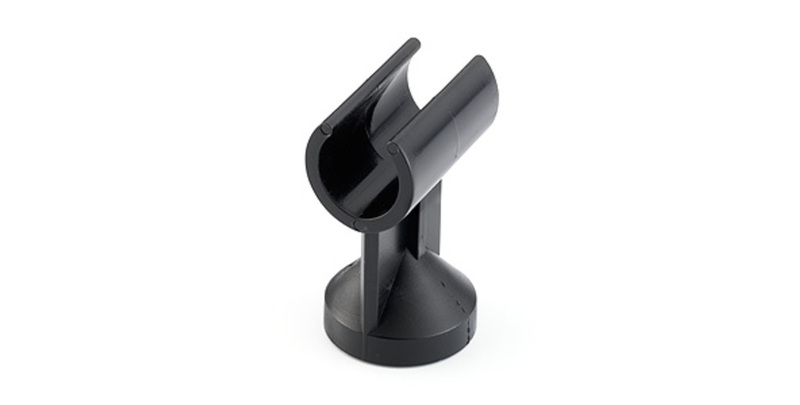 The GRAS AL0012 is a stainless steel microphone holder for 1/2" microphone sets. Another alternative is the microphone holder GRAS RA0093 which is similar to AL0012 regarding material and usage, but is provided with possibility to adjust the microphone angle between 0 and 180 degrees in 45 degree steps. If total flexibility regarding the angle is required, then consider the GRAS AL0003 which includes a swivel head GRAS AL0005. Notice that the swivel head can be purchased separatelly and can be be inserted between any GRAS microphone holder and a GRAS AL0004 or AL0006 Tripod.